We visited the Grand Ole Pumpkin Patch on Saturday and it was a total bust. It was incredibly cold. But, this stubborn mother learned her lesson... no matter what my plans are - if it is 50 degrees with winds at 15-20mph, my plans need to be changed. Brooks was scared of the tractor and the helicopter, saying that both of them were too loud. He is so sensitive to loud noises - just like Scott. 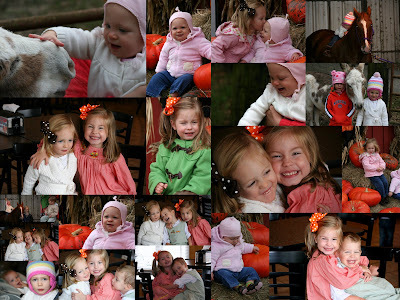 We stopped at Durbin Farms to eat our pack lunch inside, and I got the best pictures of the day then. We also got to take Jamie and Laura to the barn to meet Reed and Samson the donkey - they had a good time! Cute pictures! And it was SO cold Saturday!! Your kids are so photogenic! These pictures are absolutely gorgeous! You still made some awesome heart memories!! Looking for a special Christmas ornament?